I’m not someone who loves sandwiches, but every once in a while, I get on a kick where I really like sandwiches and really want sandwiches. It’s nice to have some variety for sandwiches though. While I like turkey and swiss with tomatoes and lettuce, I thought I’d really change it up by trying a vegan sandwich that was completely different than my normal one. I think the keys were the hummus and the avocado. The beef hummus not only added a beautiful color to the sandwich, but it also served as the sandwich spread. The avocado added the right flavor and texture to the sandwich, as well as giving it a delicious moistness. While the serving size is only a half a sandwich, it’s easy to pair this with a side salad, a cup of soup or even just some fruit and nuts. It’s a perfect size to really hit the spot and satisfy your bread craving without going overboard. 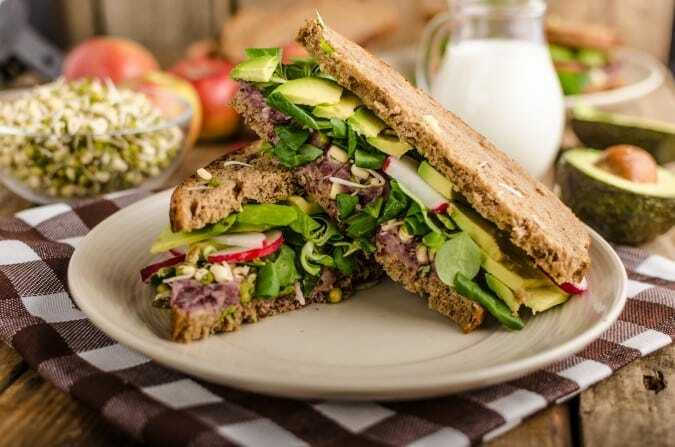 This delicious sandwich is perfect to go with a salad or a cup of soup. It's light and refreshing, but a great source of heart healthy unsaturated fats and fiber. Spread the hummus on the bread. Top with the avocado, radishes, spinach and sprouts. Top the sandwich with the other slice of bread and slice the sandwich in half.